When someone asks what your favorite thing to do is, you’re likely not going to say going to the dentist. While some people just can’t find the time to fit in an appointment into their busy schedule, some others have a dental phobia. Regardless of your situation, it’s not a good idea to avoid dental work for an extended period of time. 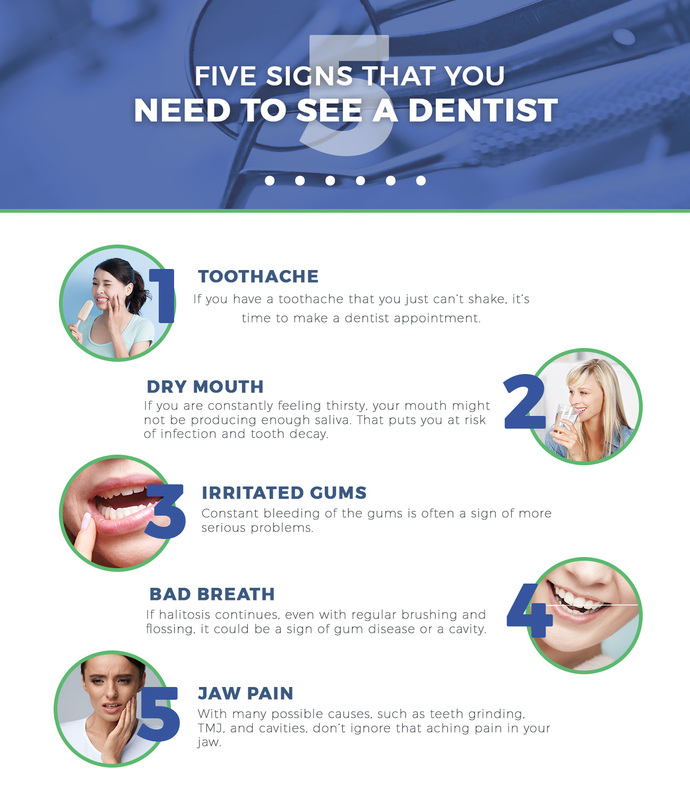 To help you know when it’s time to go to the dentist, we’ve put together this list of signs you shouldn’t ignore. If you would like to schedule an appointment, call Chess & Taub Family Dentistry today! When you have a toothache, the pain can be dull but bearable or it can be sharp and agonizing. In those situations where it’s not bringing you to your knees, it can be tough to determine when you should see a dentist for your toothache. Regardless of the pain level, if the pain is constantly there, it’s time to get it checked out. There are many reasons why you may have pain in your tooth, ranging from inflammation coming from a cavity, some sort of infection, or other similar issues. The fact of the matter is that your toothache won’t heal on its own, and will most likely get worse. Don’t wait until you’re in excruciating pain to see a dentist. While this may seem like a silly problem with a simple solution, it can actually have a greater effect on your health than you may think at first. If you feel like you’re constantly thirsty and your dry mouth doesn’t go away after drinking something, it can be a sign of a bigger issue. When your mouth is unable to produce saliva, it leaves you at risk of infection and tooth decay. This is because saliva helps to digest what you eat, neutralize acids, and washes away harmful bacteria that can eat away at your teeth and gums. A dentist can help determine what is causing this issue and recommend solutions to keep your mouth healthy. Do you see red when you brush your teeth? That is typically the sign of one of two things — you’re brushing too hard or there is something inflaming your gum tissue. Periodontitis, also known as advanced gum disease, affects nearly half of adults over 30 in the United States. While your gums bleeding occasionally isn’t usually something you need to worry about, if it is a constant situation happening over a long period of time, it’s likely a sign of a more serious problem. Other warning signs to keep an eye out for include redness of the gums, swelling, and permanent teeth feeling loose. While you may expect bad breath after eating that patty melt on your lunch break, if it sticks around even after regular brushing and flossing, it’s likely something else is happening. Bad breath can be a result of gum disease, a cavity, or other medical issues. Consult with your dentist to see what can be done to combat your bad breath. Have you ever woken up feeling like you just went 12 rounds with Clubber Lang? A pain in your jaw can be the result of dental issues like teeth grinding, but there may be other problems causing that ache. It may be caused by bacteria from a cavity spreading to the root of the tooth, resulting in jaw pain. If that is left untreated for too long, it can end up as an abscessed tooth. While the pain may go away, it’s a good idea to have a professional take a look to ensure you get the treatment necessary. There are many reasons why you might not want to go to the dentist, but your health is not something to ignore. Treat your teeth, gums, and jaw right! Call Chess & Taub Family Dentistry in Jenkintown today to schedule your appointment.